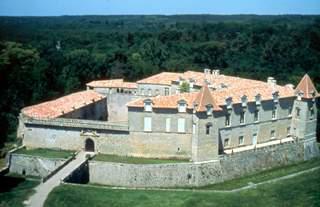 A royal site and favoured home of the Dukes of Albret, Navarre Kings, King Henry IV of France and Queen Margot. The castle is still inhabited by the Albret descendants - the Ducal family of Sabran-Pontevès. Visiting the Chateau : the Royal Apartments with antique furniture, the Great Medieval Cellars where prestigious Bordeaux wines age, the Troglodyte Caves under the château, and special exhibitions. Visiting the grounds : the beautiful chateau grounds include the famous Gorges du Ciron, medieval ruins, the Queen's walkways and caves, a man-made lake, the mill, the lavoir (wast-house), Bird island and a giant bamboo path. "A dream trip through history from prehistoric times to the present". Private theme functions, wine tasting and gourmet meals are all possible on request.